This photo was taken from The Chieftan's 1976 recording Bonaparte's Retreat. Kevin Conneff played with the group on this recording as a guest musician, and so is not pictured here. 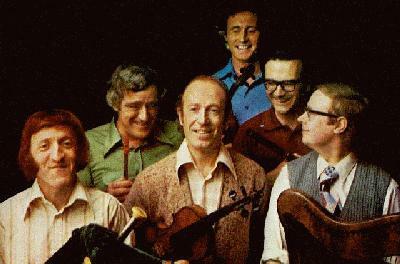 Paddy Moloney, Sean Potts, Martin Fay, Sean Keane, Michael Tubridy, and Derek Bell: The Chieftans in 1976.